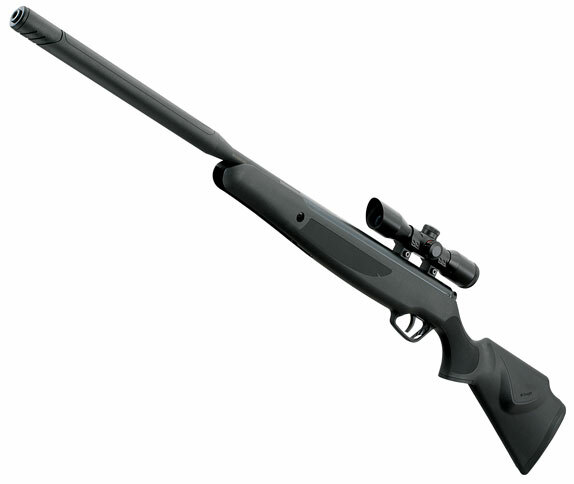 The much-anticipated Stoeger X20 Suppresor air rifles arrived at Archer Airguns today. We’ll be shipping the first units out to customers tomorrow! This first test report is based on standard “Gold Service” tests that I undertook on two guns chosen completely at random. One is in .22 caliber, the other in .177 cal. The “Gold Service” test targets are shown below. Although I’ve handled the Suppressor before, this is the first chance I’ve had to fire one. Here's the .22 cal test target. Appearance of these Suppressors is good, matching the standards seen on other Stoeger Airguns, with dark bluing and flat black stocks. The barrel/suppressor is covered with a textured black plastic material. Overall, the appearance is very tactical and practical. Cocking was easy and the triggers pulled fairly predictably but with that typical Stoeger 4 - 5 lb pull weight that somehow feels heavier than it actually is. My impression was that the trigger pull was not so long as on other models, however. The trigger assembly looks identical to that on the standard Stoeger X10, X20 and X50 models so a GTXaa trigger up-grade should fix that in style! Accuracy was at my usual average level for shooting springers. You’ll probably do better - most people seem to shoot spring/piston air rifles better than me! The scope is not AO, but I was able to see the target sharply at 10 yards once I had adjusted the eyepiece focussing ring. The scope is quite compact - slightly shorter than a Leapers Bugbuster - and has a simple duplex reticle with an aiming dot at the center. This dot can be set to glow red or green, if required under low lighting conditions. Below, the .177 test target. Well, one obvious result from testing these two guns is that the .22 was significantly quieter than the .177 caliber model. Confirmation came from my wife, who’s used to hearing our “Gold Service” testing. “Wow, that’s quiet.” was her comment on the .22. But I found the tested .177 still to be quite loud. This is probably connected with the fact that the muzzle velocity of the .177 was over 1,200 fps. That’s well above the typical 920 - 950 fps muzzle velocity of .177 caliber X10 and X20s. It’s also above the speed of sound and the loud crack was due to the pellets going supersonic - a silencer is not going to change this. With only one gun tested so far, I don’t know if this will be typical. As the .22s were not breaking the sound barrier, this gun was much quieter - with shots sounding like a dull “thunk” rather than the sharp, high-pitched crack of the .177. Should .177 muzzle velocities drop back below 1,100 fps as the gun burns residual oil in the compression chamber and “dries out”, the noise level of the gun should drop significantly. Again, more testing will give us the answer. I hope you do more testings on the .22 X20 Suppressor! I would like to see how does it behave once dieseling is over. Steve, is the cocking effort on the X20S similar to that of the X20? I would imagine that, if the greater power of the guns you tested stems from a greater capacity spring (as opposed to dieseling), the cocking effort would be greater. Thanks for being so prompt in satisfying your customers' interest in learning about the new model. Thank you for the initial report (can you try another 0.22 cal and verify the FPS? ), I ordered one from your company and look forward to receiving it. Please upload a YouTube evaluation when you have a chance and can you confirm the trigger can be upgraded like the x20? Cocking effort is surprisingly light on the Suppressor, about the same as a standard X20. And yes, the GTXaa trigger up-grade does work on the Suppressor. I've installed quite a few already! I would prefer to NOT have a scope on the gun. I prefer open sights for Blackbird control in my backyard. Do you know is it possible to buy a X20 and replace the barrel with the X20 Suppressor barrel? I have been very happy with the quality of this rifle. It's pretty much relegated my Whisper to the closet. Mine may be an exception but was extremely tight cocking, the very first time I actually had to tap it with a rubber mallet to get it to break. It's lightened up a bit, but I still have to slap the top of the barrel end with my palm to break it open. Scope was dead on zero out of the box. Well done! Zoom, I'm glad to hear that you also are happy with the X20 Suppressor. I'm in the habit of always slapping the end of the barrel to break open these guns - that little extra inertia certainly helps, as you have found too. Hi There, I've just got a new X20 S .22 and I m amazed with the look and feel and also the sound but I m having lots of problem in zeroising the scope (I changed the scope to a centerpoint scope), can you please tell us what is the best pellets to use it thx. I've found that Stoeger X-Field pellets work best in the Stoeger X20 Suppressor. 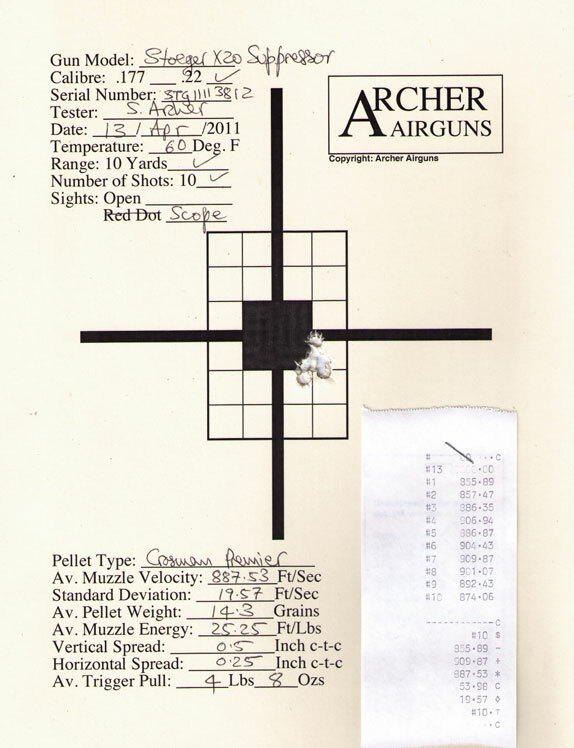 That's what we use for our Gold Service testing these guns here at Archer Airguns. Somebody help me! I’m fairly new to air gunning and for Christmas (today); my wife bought me the ATAC Suppressor in .177 caliber. Could not wait, after unwrapping it, to go out and take a few shots. She bought this model because of its advertised quietness. We live in a gated and strongly enforced covenant area demanded a quite shooter. So, first shot, CRACK!!! Sounded like a rifle shot making me think it likely went supersonic?????? Well, this won't work at all! Do I need heavier pellets, a .22 caliber, change neighborhoods, etc.??????? Please help! Thanks in advance! What you experience is not unusual and probably is the result of one of these two issues. 1. All new spring-powered air rifles "diesel" until the oil present in manufacturing is burned off. This often causes a loud crack as the pellet can be fired at greater than the speed of sound (approx 1100 fps). Serious dieseling usually stops after about 10 shots. 2. If you shoot very light, lead-free pellets, the ATAC will certainly shoot faster than the speed of sound, again giving the loud crack. So, the solution is to shoot the gun enough to eliminate the dieseling and/or use heavier pellets that do not exceed 1100 fps with this air rifle. Just started using the 20X S today. I started with the factory trigger and a non factory scope. First three shots were a 1/2 inch group at 10 yrds in an unsupported sitting position. After about 10 shots I replaced the factory trigger with the GTX trigger. It took 5 shots to get the feel of the trigger and after that my groups started to shrink. 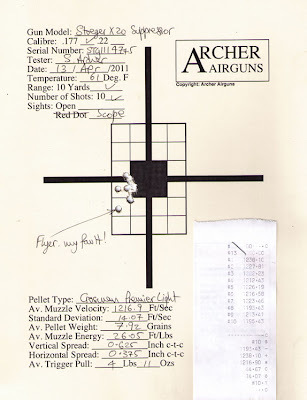 By 60 to 70 pellets I had a very tight 1/4 inch group at the same distance and shooting position. the factory trigger is acceptable but the GTX is amazing. It forces me to focus very carefully on my holds and breathing. This rifle is so accurate that I know exactly when I do something wrong in my fundamentals. You need to post the real velocity numbers, meaning after it's done dieseling. You will find it is less powerful that all other guns in it's class due to it's barrel. It isn't as quiet as they claim either, a Trail or similar Crosman gun is quieter, and much more powerful. Many people note excessive dieseling with the 20S which is due to excessive grease. I believe this was done to boost velocity of all the testing they know people would do and post online. If people posted the real numbers sales would plummet to nothing. I disagree! We do publish muzzle velocity numbers after dieseling has gone. The muzzle velocity of the Stoeger X20 Suppressor is comparable with many other "1,000fps" break barrel air rifles under identical conditions. It's true that some early models did suffer from too much grease used in assembly, but this was corrected by the factory and was not undertaken as a muzzle velocity-enhancing measure. any experience with heavier pellets?